October UK Mug Swap! Join In Now! 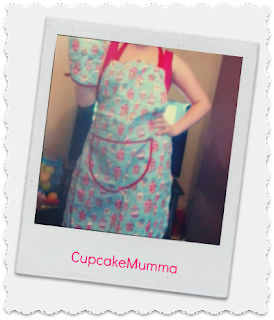 Through the month of September I would love to recruit some fab bloggers (and non bloggers of course!) 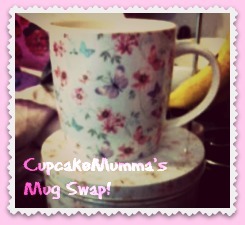 to join in with my UK Mug Swap. 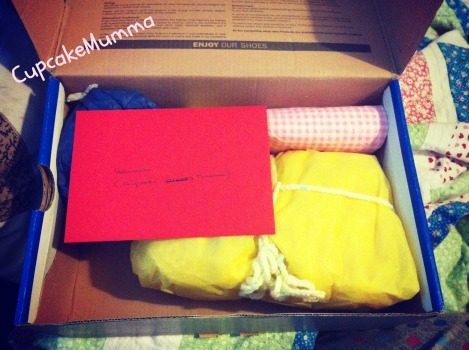 I'm a big fan of gift swapping. It brightens up my day when I receive an e-mail, a Tweet and often read a blog post all about a gift I've sent to someone. To know that I've brightened up someone's day, made their morning better or just simply given them something to look forward to well,it's a great feeling. Then there's the lovely surprise for me from my postman when I get to receive and then open my thoughtfully purchased and wrapped gifts from a fellow blogger. I enjoy relaxing with a hot chocolate when the children are tucked up warm and delve into my surprise. 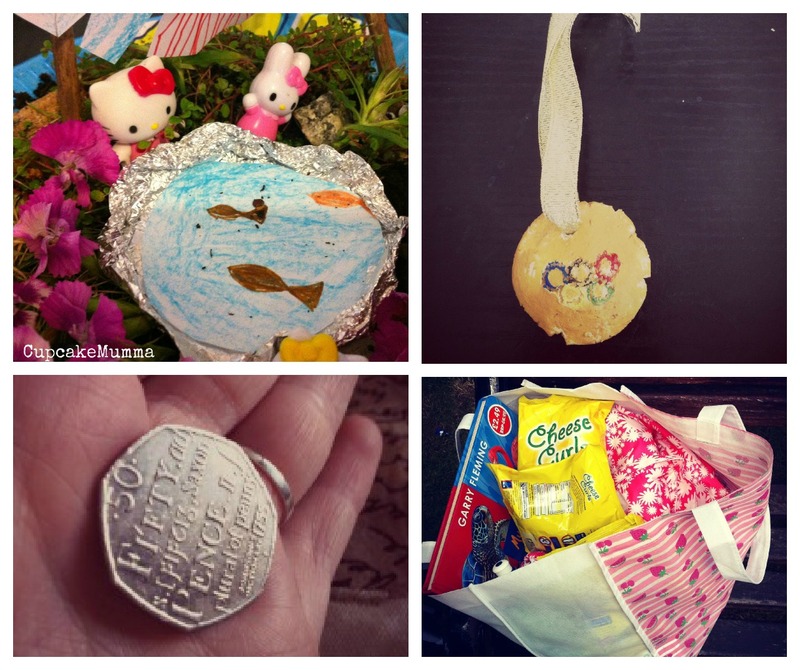 Most swaps are about handmade items or a mix of hand making something and buying something for a set amount. I decided a mug swap would be something quite different and after getting permission from Natalie who hosted a Mug Swap in the US, I thought why not? So, if you'd like to be paired up and hunt down that perfect mug for someone why not join me by signing up during September? Swaps are a great way of discovering new blogs and making new friends not to mention making you and someone else feel good. Please include your full name, the postal address where you would like your gift to be sent and if you do write a blog, why not add that in too? I'll pair up everyone by the end of September and then you're free to mug hunt until 31st October! If you don't write a blog please also feel free to join in! Perhaps adding some of your favourite things into your e-mail would help your swap partner? 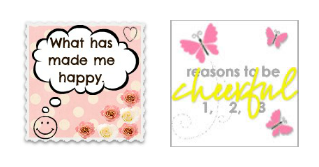 Reasons To Be Cheerful is hosted this week by Angie at Cake,Photos,Life. 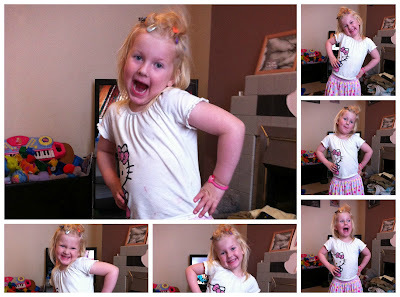 I'm also linking up with the lovely Sian at You're Not From Round Here for this weeks What Makes Me Happy. First of all I received a rather lovely surprise this afternoon when the postman arrived. I waited all day for my quiet time (read, time when I'm alone and the children are asleep) so I could take my time and really appreciate this homemade box of loveliness made for me as part of a summer gift swap. I'm not telling you what's inside, you'll have to wait for my next post! Another lovely surprise from the postman this week was my rather awesome new(ish) pink converses which I LOVE and I have wanted for an incredibly long time. I absolutely love them and what's even better is they cost me just £23.50 from eBay and have been hardly worn! I was feeling a bit down yesterday and went out with Midge to buy her uniform. While I was sat waiting for Midge to finish her sausage roll before entering the store I was befriended by a rather lovely little dog. They really do know how to cheer you up don't they? It's nearly September which means I'm jumping ahead and looking forward to October because it is my birthday (yey!) I love birthdays but i'm also excited because this year I want to have a little Halloween party for the children. Fingers crossed everyone's free! And finally I'm hoping people will want to join in my October UK Mug Swap which I shall be blogging about very, very soon so please keep your eyes peeled if you feel like posting a mug and maybe a few nice little things to a fellow blogger. I had a message this morning which I wasn't expecting. A friend of the family, more family than friend, had passed away. I'm not really sure what to write here to be honest. The last time I saw Anne she was tired, bored and then all of sudden I entered her house with my new husband and 4 bridesmaids and my goodness, you've never seen a bigger smile on someone's face. I feel pleased that I got to her one last time, on my wedding day no less. She had no idea we were coming. Little Miss had drawn a picture in a card that we wrote for her saying how we wish she could see us wed but hoping she was well and we'd see her soon. Of course we did see her soon but we won't see her again. Won't get to give her the wedding photos we promised we'd give her. She was such a wonderful lady. We knew she was getting worse when she gave up knitting. 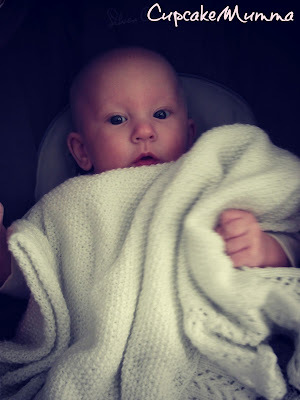 When Little Man was born she made him a blanket. A beautiful, white blanket. It's now a slight grey colour and he doesn't go anywhere without it which I never thought would be the case. Midge never had a special blanket like a lot of babies so I just assumed Little Man would be the same. I'm glad he loves his 'blankie' though. I'll miss Anne. She'll be missed by a lot of people and won't be forgotten. I won't forgot the words she left me with on my wedding day and I won't forget that now she is at peace, resting with her husband whom she was married to for 60 years. It was a bit of a mixed day yesterday. Weather wise the sun was shining and it felt quite warm which was a considerable contrast to cold and wet the day before. We had a pretty miserable night, well I did, Husband has a knack of sleeping through anything which I'm very jealous of! The children were up twice, I think the noise outside disturbed Little Man a bit but he soon settled off with a kiss and a cuddle. I was kept up till 4am thanks to some drunken tiff or something like that, I really have no desire to spy on these people and find out. Once he left the youngsters came out to create a bit of their own noise for half an hour before scuttling off as well. So as you can imagine I wasn't too pleased to be greeted by Midge waking me up at 7.30am no matter how reasonable that time may be. Husband left me to have a lay in but I quite fancied us all going out as a family. Unfortunately we ended up having a minor disagreement setting my mood right back. We also decided that perhaps swimming wasn't such a great idea and opted for Heartlands instead. As luck would have it, Heartlands is right next door to Comet. Why is this luck I hear you ask? Well, thanks to a rather substantial milk spillage the previous day our microwave decided it had enough of our family and refused to work anymore. Not even a fuse change could tempt it. Another bit of luck was having received a £50 gift voucher for Comet from some family members which we're really grateful for! We let Midge pick out the microwave on the way home and I have to say she chose a nice small, stylish one. We all walked to Heartlands which was a bit tiring being that all of us were a bit worse for wear. We had a good look around the outdoor and indoor market, found a nice hair band for Midge for 50p but not much else. 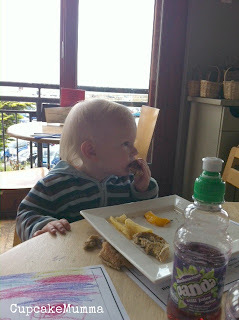 We then went to Tesco for a spot of lunch. I was a bit fed up at this point. Midge was getting an earache, Little Man wasn't interested in eating his lunch which I had just spent £2.50 on and a lady in the que bitched about us taking too long in the children's section. We heard her well enough but never really bite back. What's the point? If you have nothing nice to say just don't bother saying anything surly? We sat in front of them as well which was annoying, I was in a much better mood when she left! We finally got to Heartlands where we had a quick walk through. The children played on the grass, the sun held out and Little Man had his first dip in the running river. I have to say that I am glad we did decide to go out and about. The fresh did us some good and the children had fun. Midge's earache came out good and proper when we returned home so she went to bed all dosed up and warm while Husband and I caught up on our trashy television and I started making my sisters going away present which is proving difficult with limited funds! Shattered after a long day. But still smiling. Here Come the Weather Blues! I don't know if you're like me but when the weather really turns nasty I find it a real struggle to get out of bed. I'm pretty glad school is starting soon because it'll be a 7am wake up which this house hasn't seen in a long time. We all like our sleep but on a rainy, cold day we are all even more reluctant to get out of our pits. Alright, the children still wake up and are quite happy to play while Husband and I have a few extra minutes. Planning more country learning days. We had our America day a couple of weeks ago and that went down really well. We have plans for a Chinese Day, Polish Day and of course a British Day (I can't resist!) just one more which is proving tricky..probably France though as it is a language actually taught to our children! My little sister is heading to university at the end of September so I want to plan a good send off. We're thinking of getting back massages and lunch and I'm making her a little gift to go away with. I'm going to ball my eyes out when she leaves! Lets not forget Christmas isn't all that far away either! The pennies are tighter than they have ever been right now and we're putting money back to visit some family in December which will be lovely but it's also making me think that now I'm not storing tonnes of wedding stuff I can replace it with Christmas stock! (Shhh don't tell husband!) What will be really great is when I get my Park vouchers in October! For now though I'm going to sit in my PJ's, watch Celebrity Masterchef and play with Twitter my 2 babies! I have a good few things to write about this week (and perhaps last week as I was too busy to blog!) I haven't joined in with Reasons To Be Cheerful for some time so I thought I would start again this week. 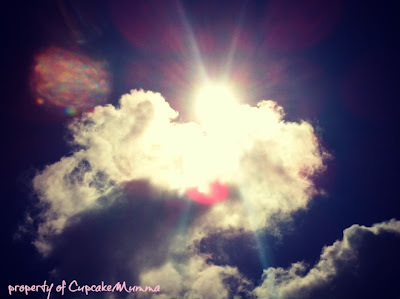 I'm also linking up with You're not from Round Here to join in with What Has Made Me Happy. Enjoy! First of all I'm very happy to be a newlywed! Myself and Husband had such a wonderful weekend, received lots of wonderful and generous gifts as well as collecting some brilliant memories. In the end it all went very fast and we both wish we could rewind the evening one last time! Little Man had his first haircut. At first I was a bit shocked to see his little curls all gone but the neat, blond head of hair he now has makes him look a little more grown up and doesn't half remind me of my brother when he was a small boy! I also visited St.Ives recently with my Mum and younger sister. It was such a wonderful day and I loved dipping in and out of crafty, hand made shops, eating a delicious lunch and visiting The Tate St.Ives Gallery. I hope you've all had something to smile about too! Well finally I am back and back as a 'Mrs' no less! On the 18th August myself and my lovely man finally tied the knot and you know what? We had an amazing day. It was wonderful to see the family again so many that we have never met or not seen in a very, very long time. The whole weekend was just as emotionally draining as it was physically but we had such a great time the tiredness was worth it! I'd now like to share our special day with all of my lovely followers just as I promised! The night before the wedding was very stressful. The house was a pit which really needed cleaning as there was going to be so many people filtering in and out the next day. Both of my little monkeys were screaming at me and throwing a fit at anything they could think of so I called in reinforcements: Mother! Pretty soon we had the children bathed and in bed ready to do the final touch ups on my dress and come to terms with my nerves. I did a lot of deep breathing that night! The Groom meanwhile was having a nice drink and a catch up with his Dad, brother in law and some friends. I'm told he stayed up pretty late watching TV and yes, I got a few soppy text messages while he was out drinking. This made me smile. The second photo is the detail of my dress. Pinned to my waist I added this tiny little bird which was sent to me from my Aunt. She also sent me a six pence (which i forgot to pop in my shoe!) a cross necklace which now hangs by my front door and a photo of her Aunt which I kept in my wedding purse. I also had my Dads St. Christopher sewn under the bird but sadly it must have fallen off at some point. Maybe someone else will find it and it could become another persons 'something old.' Sorry Dad. Here is my beautiful bouquet. My Uncle bought this me (it was very hard saying goodbye to him! He's so similar to my Dad!) All of the roses are handmade and artificial, we have some lovely photos and as it'll never wilt I shall be putting it on top of a corner shelf in my bedroom! I finished the bouquet off by adding some flower pins just like the children's bouquets which I made. The pins gave the bouquet an extra sparkle. We got married locally at our beautiful church. I was so nervous but our vicar well, you couldn't ask for a better one. He calmed me down and we chatted for a bit. Myself and my bridal party were 15 minutes early which was actually lovely because we were stood just outside the bell tower listening to the bell ringers before we went in. The bell ringers helped to lay my dress out then before I knew it I was walking down the aisle with my wonderful Father, saying 'I do' and ready to party! Taking the rings and making life long promises! My sister as Maid of Honor, my niece, daughter and cousin as Bridesmaids. I felt very honoured to have 4 such beautiful bridesmaids. 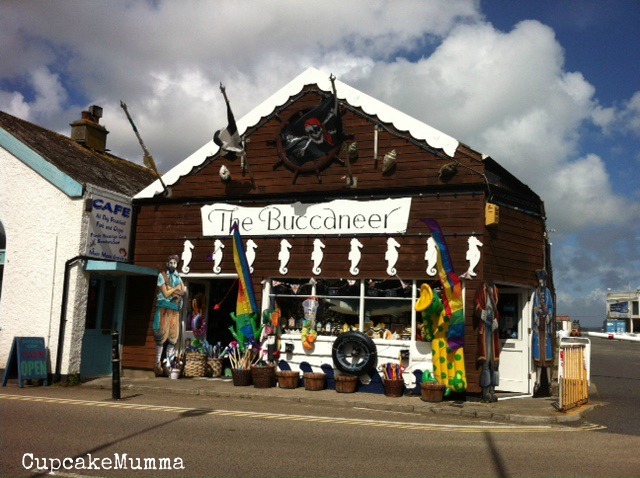 We set off after lots of photos to The Lugger Hotel which is situated in Penzance right on the seafront. Our hotel room looked stunning decorated with hearts, roses, champagne and flowers. I think it was my Aunt who paid for the wedding package so thank you very much! We had a live band called The Elementary Penguins who were superb. The lead singer is a friend of the family but the whole band are lovely and really talented. There was so much food it was unreal and the cake looked really pretty, just as I had wanted it. One of the highlights of the night was driving to the venue with my new husband, my Grandma in front next to my Grandpa and having a lovely little chat. As we got just about walking distance to the reception venue poor Mrs Woo (Granddad's very nice 1960's Jag) decided she'd break down! Well, out the bride and groom got! We walked about half way when my uncle came to the rescue with his car. My Dad didn't want his daughter being pushed or walking into her venue! I thought it was hilarious and as I carried my dress a bit too high the on lookers of Penzance got a good look at my garter! 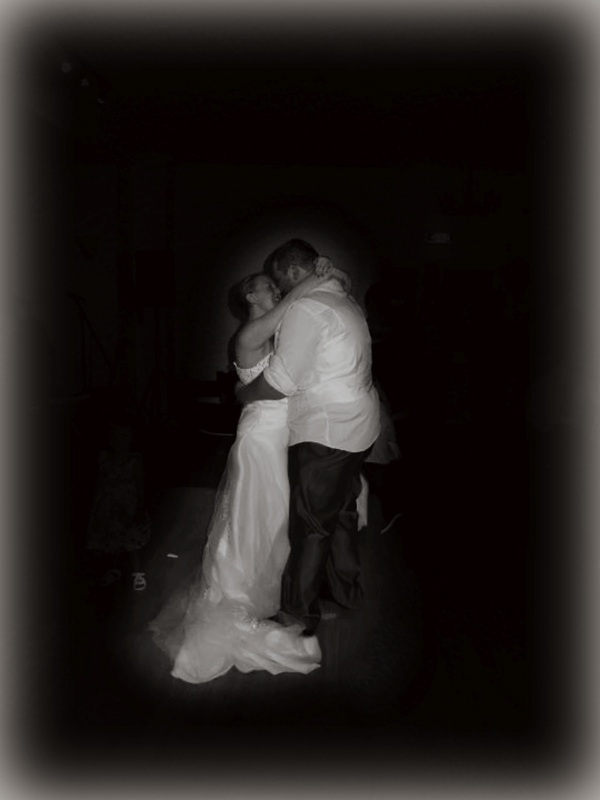 Here is our first dance. It wasn't as bad as we thought, all the nerves disappeared and I just fell into some loved up bubble to be honest! We danced to Florence and the Machine's You've Got The Love which was great to dance to. Mr even learnt the words properly! We had a wonderful time. I had to apologise on several occasions which I wasn't too impressed about but there were many more highs than lows! Husband's Best Man was excellent with organising everybody and the speeches were fab. Our nephew actually did the Best Man's speech which was the most wonderful and adorable thing I've seen in a long time and a great idea. Husband wants to frame the speech and my brother's girlfriend filmed the whole wedding which I cannot wait to see! I leave you now with a photo of the rather fabulous Mrs Woo! The other day I sat down and flicked through my photos to find a list of 21 questions that I copied off of Facebook. 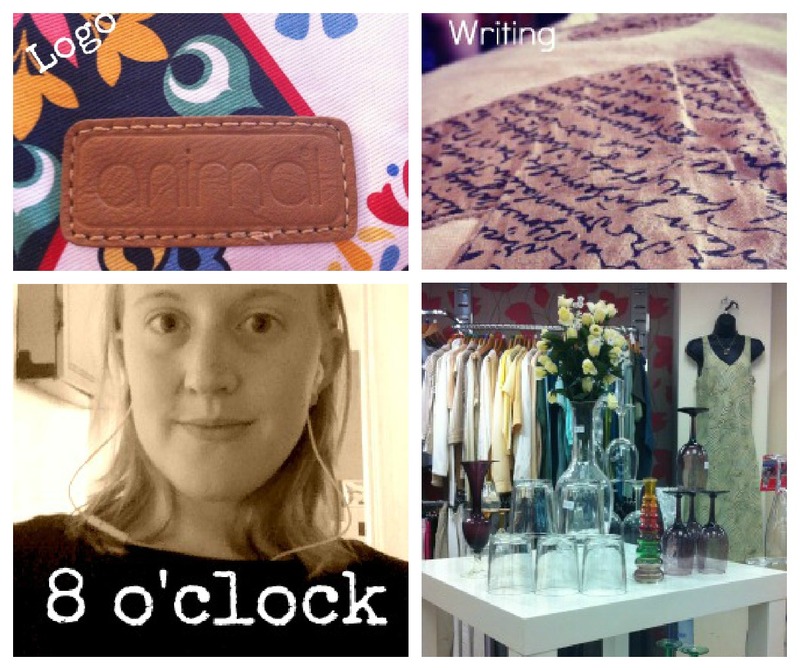 I asked Midge these questions and thought I'd share them with the blogging world. Enjoy! When you can make a cake! When you go to the park and play on the slide all by yourself. 16. If Mummy was a cartoon character, who would she be? We go on trains, like animals and Paradise Park and the park! I hide under covers but you like them on you to keep you warm. There you go, 21 questions from my beautiful Little girl! I've been a bit off the radar with this impending wedding of mine and I'm definitely missing my blog so I'm back to write up a couple of posts which will probably be it until after the wedding, we'll see. We started off our America Day with making flags. I printed some flags off and asked Little Miss what the colours of the flag were (expecting to have to tell her) and was surprised when she said 'red, white and blue Mum!' Now, I think she may have chose those colours because of the fact our flag has been paraded around everywhere (including the bunting in my kitchen!) but who am I to argue? After all, she was right! We made the flags and talked about America. We put on some fake accents which was very funny, Little Miss was in fits of giggles (evidently I don't put on a convincing American accent!) 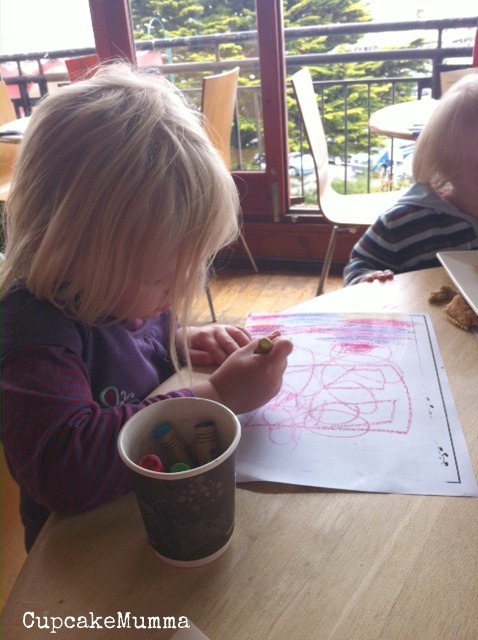 we discussed various states and I explained to her about all the stars on the flag. That was enough for a 4 year old I thought! We then took ourselves to the kitchen to bake a fantastic recipe mailed to me by Reecea who blogs at Fresh juniper. She very kindly shared with me a delicious Peach Cobbler recipe. We put our Cobbler together and once done it was the first treat on our table! To the table we added some chips, hot dog sausages and buns, an American potato salad and pasta dish plus some marshmallows and Hursheys chocolate syrup. very yummy! Peach Cobber, soya ice cream and home made banana ice cream! The children tucked in more than ever before so I reckon our America Day was small, but fun and more importantly- a big success!! We're currently deciding on what country is next, we think we might go with China Day which would be good. However, lets get this wedding over with first! Would you have a 'Country Learning Day'? I'd love to know if you do! I just wanted to show you all something really useful and really cool for all those cooking and baking lovers out there. Introducing the Kitchen Cheat Sheet. I'm printing this and sticking it on my fridge because I am forever hunting the conversion charts on my phone and this has much more. See for yourself! Simply click this image to go to a full, printable size! *I've not been paid to post this, I just find it really useful. 4) This is where I sat today, at the park on the bench next to food! 10) My new engagement ring- it fits and suits my wedding ring a lot better! Polka Dot Swap - My Gift! 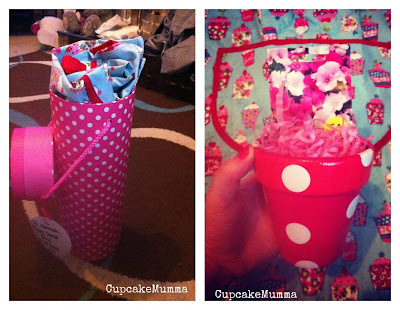 I recently blogged about the polka dot gift swap I did here, all of which was started off by Popular Crafts Magazine. Tonight, after finally managing to get my photos to load from my phone, I can show the world what the lovely Natalie from Ready,Steady..Mummy! sent me. It was pure coincidence that we were set up as partners and I am so thrilled at our stroke of luck- her gift is thoughtful and full of what I love! When I unwrapped my parcel pink just screamed at me! This wine bottle gift box was a great idea for putting my gifts in. When I popped the lid off my gifts were almost jumping out! At the top you can see cupcakes this made me smile! Right at the bottom however, Natalie had found a plant pot and painted it this lovely shade of pink- it's great! It wasn't until I read Natalie's post that I find out the dots were stuck on! This was a great gift idea and will totally cheer up my garden. She also popped in some of these beautiful flowers (and lots of shredded paper!!) I love gifts like this! Also in my gift I had some bought items which is rather a lot like a challenge these days! 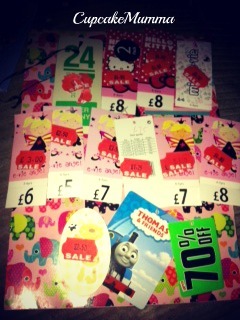 As part of the swap you have to buy a gift totaling no more than £3. I love a good hunt and it seems Natalie does too as she picked up an apron and matching oven glove- they are so me thank-you!! Last but no means least the most thoughtful and lovely part of this present was this gorgeous card Natalie sent me. 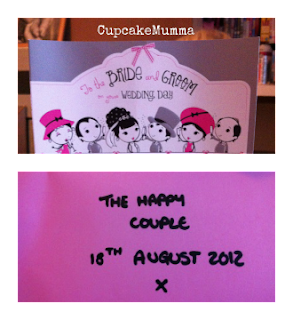 As most of you who check in with CupcakeMumma will know, myself and The Man are soon to be husband and wife. Natalie sent us this wedding card and it has pride of place in my front room as the very first card I have. I think she made me cry a little if I'm honest! I just want to thank Natalie for her thoughtfulness, thriftyness and really looking out for the things I love. I have more swap posts coming up in the future, including my own so please check back soon. 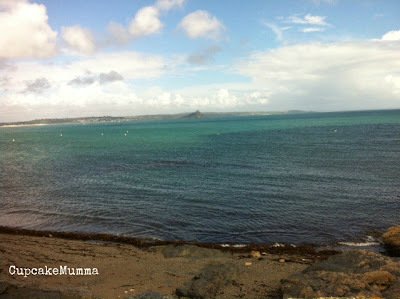 We all went out, rather spontaneously I must admit, to Penzance the other day. It was lovely and sunny with occasional showers. Lucky by occasional I mean 2 showers lasting all of 10 minutes. It would seem it was pouring down back home so I'm glad we made the decision to pop out for the day. 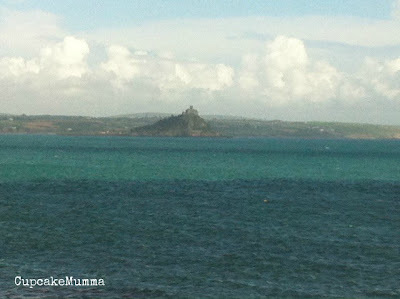 We got off our train at Penzance train station, Little Miss already excited at seeing the sea. We weren't there to see the sea or have fun in the sand though as we did have a slight agenda. 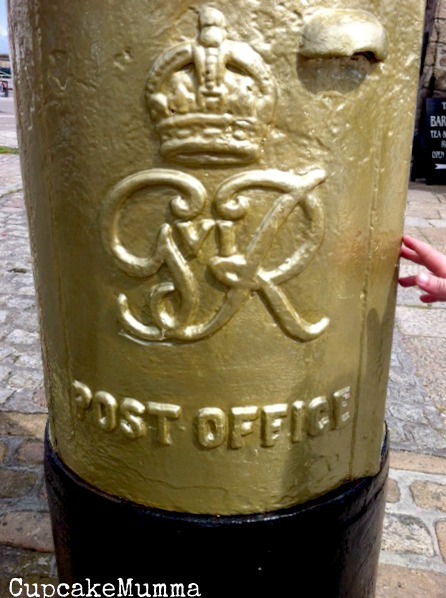 We're having our wedding reception in the beautiful Penzance, over looking the promenade no less (insert big grin here) so we needed to visit the venue to pay some final funds off and double check everything was still going to plan. Unfortunately the lady we needed wasn't there, the manager was really rude (I don't care how stressed you are you never deal with customers in an off hand manner) luckily we spoke to a lovely gentleman who sorted what could be sorted and everything else is running smoothly. Next stop was Peacocks to look for some nice underwear for said wedding day, I found some nice items in the sale and bought myself a new jumper (first jumper I have ever owned! I love it) and then we proceeded to take full advantage of the half price sale for Little Miss who desperately needed new clothes! We ended up with a good haul leaving very pleased with our finds. We're all allowed to show off now and then! After having a good town browse, not spending too much unless it was something in the sale, we ventured down to the front where the arcade is centered. Little Miss is so lucky when it comes to playing in the 2p slot machines. I personally can't stand the place but The Man has a bit of fun, they won some tickets getting a barbie and a small teddy ornament while I sat outside with Little Man patiently waiting for the arcade phase to pass! 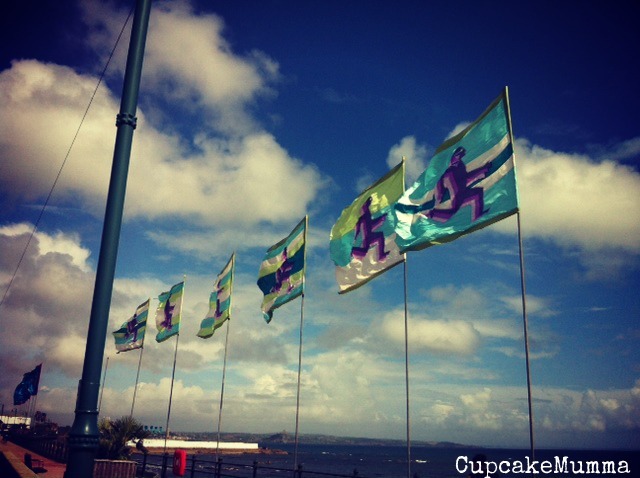 I loved these flags on the promenade. postcard and some rock for my primary school class mates. We had a lovely walk along the promenade, it was very windy so we all held on tight to each other and the pushchair. The view was beautifully clear so I got some pictures of the sea (surprisingly calm despite the wind) and the wonderful St.Micheal's Mount in the distance. The photos make it look further away than it is. If the tide wasn't in so far I think we would've gone and walked there but it's just something lovely to do for another day. The bonus to walking this way was that we saw our very gold sprayed Royal Mail post box! 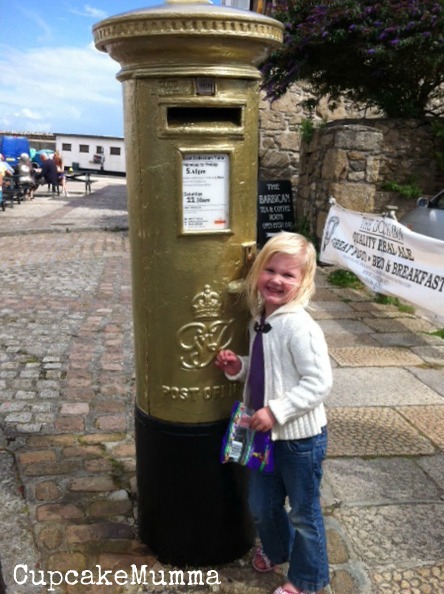 This was done to celebrate Helen Glover who won gold with her team mate Heather Stanning in the rowing. Little Miss just had to get her photo taken and I had to have the memory! We had a long walk back through the main roads to go and meet our train. Unfortunately we missed the train and had to wait for an hour to catch the 7 o'clock one. This meant sitting in a large waiting area which slowly filled up until we decided to buy a large portion of chips and sit outside. Luckily we didn't miss the next one (imagine that) and didn't loose money on a return ticket (always annoying isn't it?) by having to take the bus instead. Little Man was pretty tired and screamed most of the way home. He ripped off all of poor Barbies limbs which meant Little Miss was extremely upset. Needless to say, despite a lovely day I was glad to get home and pop them to bed! 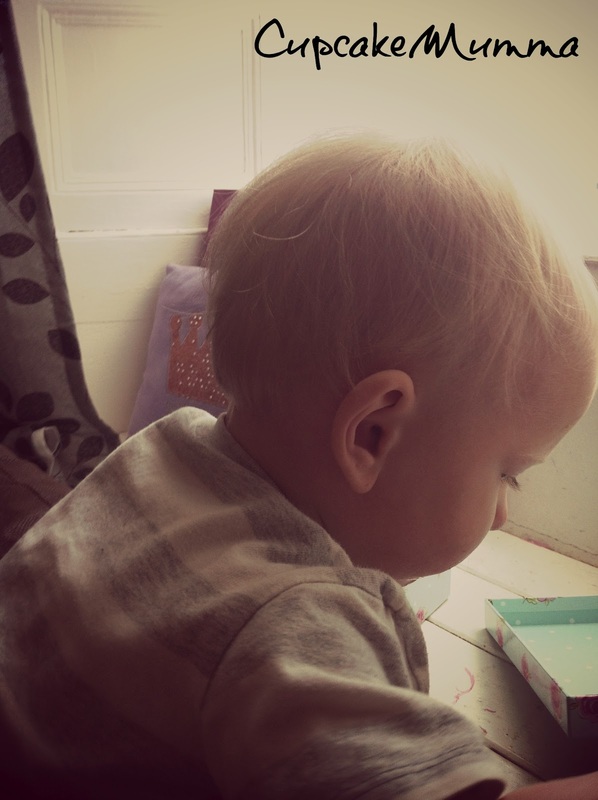 I'm linking up this post with the lovely Natalie at Ready,Steady..Mummy! 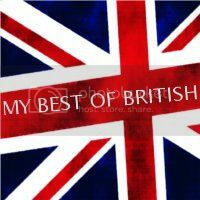 who is hosting a 'Best of Britain' link up to share our parts of the world. I really do love Cornwall so I hope you enjoyed my post!